Do you want to discover the impressive underground world of cenotes? Well, the Mayan Riviera is the place to do it. Built on a limestone shelf, this area has the longest underground river system in the world. The rainwater drips its way through the limestone, and come out fresh and clear. You can have cenotes that are completely exposed (like a lake) and some are partially covered or fully underground. 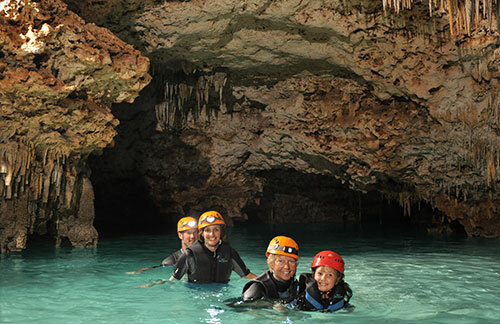 In the Rio Secreto Expedition, you will have the opportunity to visit the world underground. Get ready for this adventure that will take you through caverns to see the impressive rock formations, crystal clear waters and 600 meters of underground world. Groups of 8 allow for maximum intimacy as you hike and swim through the cenotes. The ancient Mayans believed that the cenote waters had healing and rejuvenating powers. Why not give it a try? Discover a miracle of nature and allow your senses to indulge the cenotes. INCLUDES: Guided tour, wet suits and safety equipment, towels, lockers, and snacks. HINTS AND TIPS: Pregnant women are not accepted on this tour and the maximum weight is 120 pounds (120 KG). Wear your swimsuit, bring a towel and money for souvenirs. Do not wear lotions, hair gel or other beauty products that will pollute the waters. Sunscreen is not necessary as you are in the caves. The photos are quite expensive ($25 each) so bring your camera. KIDS: Aged 4-11 and suitable as long as your child is not afraid of the water. Children younger than age 4 can be cared for by trained staff during your experience, but please contact us directly to make arrangements and check availability. WHEELCHAIR: You must be able to walk without assistance for this tour, therefore this activity is not suitable for wheelchair users. RESERVATIONS: Please reserve at least 1 day in advance.